8:30pm: There’s a tornado watch for NYC! 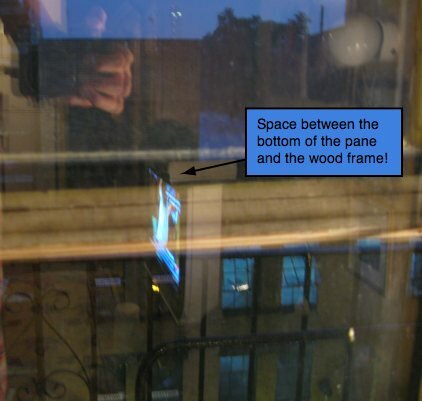 8:20pm: I’m getting a little nervous about the possibility of blown out windows, they’re all half-falling out of the wooden panes as it is. I’ve got plastic and a staple gun ready to go. Just don’t decapitate me. Or the cats. I was also worried about the roof, that has been leaking for 30 years, but the landlord has made recent patches. I’ve had four landlord in this building, and they never actually repair the roof. They just keep patching. 6:45pm: ZZZZZZZZZ. Wait, what? 900,000 people are without power?? 3:45pm: Back from sight-seeing. The internet host for my company Echo emailed me to say they’d been ordered to evacuate and they’re in Zone B so I wanted to see what it was like out there. I’m in Zone C. Right now it’s very quiet, it’s just lightly raining, and a few bars and restaurants are open, so naturally people are disaster-drinking. 1:00pm: Finished my super healthy lunch of brown rice and brussels sprouts and strawberries for dessert. Need to be strong and healthy in case of hurricane apocalypse and I need to help rebuild civilization (and fight off zombies). 11:40am: Just a little rain here. I worry about my pigeon. 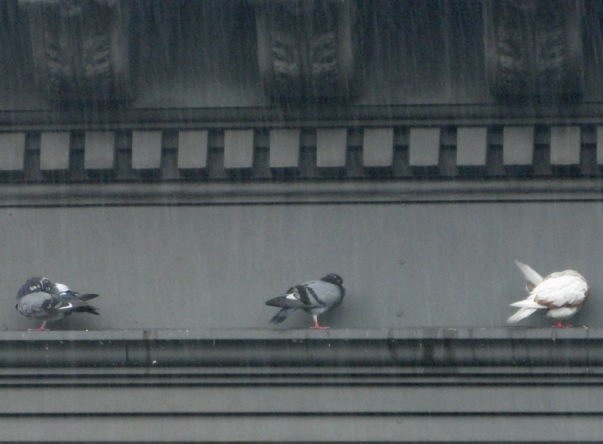 The picture below is of pigeons huddled against the rain on the building across the street. I think the long wait must be awful. With a tornado, there is some waiting…lots of weather reports…but not knowing where or IF it’ll hit is usually a matter of hours or minutes. 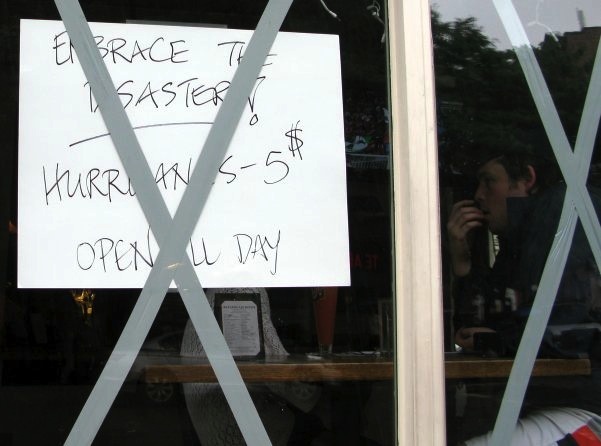 The days and days of building anxiety for a hurricane must be distressing. Irene does seem to be weakening, and maybe it won’t be as bad as first thought. However, the flooding is still a big threat…and possibly loss of electricity. The wind though may not be as threatening. In SoMD we’ve mostly had heavy rain, some moderately heavy wind gusts but nothing really alarming. However, the center is just crossing the NC/VA state line right now, so its supposed to get considerably worse overnight. Glad our power lines are underground. The Delaware and NJ beaches are going to get decimated in terms of beach erosion. The local news station has a fellow on the Ocean City MD boardwalk, and the ocean is already blowing seafoam across the boards. Also, the track has the center following the Garden State Parkway on the way to NYC, which means the NJ barrier islands will be on the worse/eastern side of the storm. NYC is somewhat in a unique situation, since the winds hitting highrises above 25 stories are reportedly one category higher than what it is at ground level, and Manhattan will be the first real concentration of skyscrapers in the storms’ path (excepting the Atlantic City boardwalk casinos and some of the larger beach hotels). You made me glad I’m low to the ground (5th floor). I’m glad it’s not too bad for you yet.